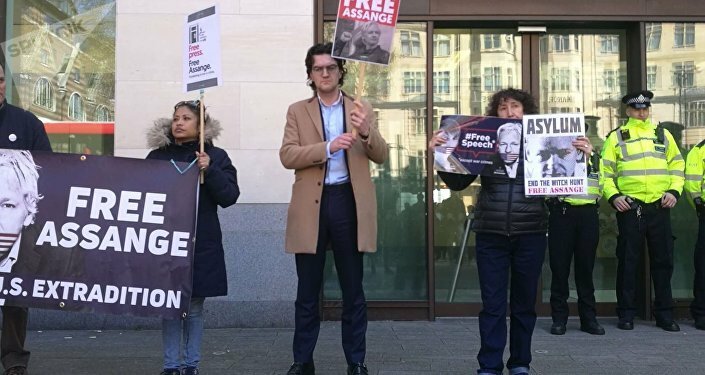 Demonstrators rallied outside of the Westminster Magistrate Court in London after Wikileaks founder Julian Assange was forcefully taken into custody by Metropolitan Police around 10:50 am on Thursday. "We don't really know," the protester said. "The charges have been Trumped up to some extent from the US, so we don't know if they're going to file for extradition or not." 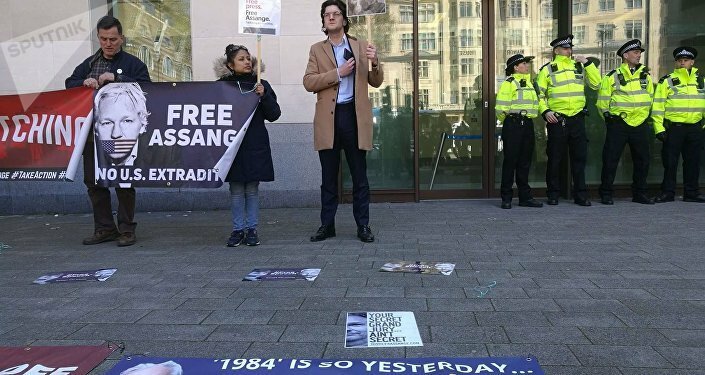 "The worst thing is that [Assange] had political asylum and he was dragged out of the embassy with the go-ahead of the Ecuadorian government and the Ecuadorian ambassador to the UK." "As far as I know, the man should be freed and nominated for a Nobel Peace Prize, not treated in the manner he was — like a criminal," the protestor added. "He hasn't committed any crime here or anywhere else." When asked how the #FreeJulianAssange rally would fight for Mr. Assange's rights, the protestor said, "There is no organisation". "We're all individuals that believe in freedom of the press and human rights," the protestor said. "So we've got no organisation and Wikileaks is not involved in any campaigns but their work." "The freedom of the press is absolutely in danger," the protestor added. "If Assange goes down, we're all going to go down". Sputnik also heard Wikileaks Editor-in-Chief Kristinn Hrafnsson give a public statement following the hearing, who said that US extraditions of whistleblowers "must end". "Anyone who wants the press to be free should consider the implications of this case," Mr. Hrafnsson said. "If they will extradite a journalist to the US then no journalist will be safe." "This must stop," he added. "This must end." Folowing his arrest, Mr. Assange was found guilty of breaching bail in 2012 when he fled to the Ecuadorian embassy in Knightsbridge, London. Assange will be sentenced next month at Southwark Crown Court, Judge Michael Snow said, adding that Assange's assertion of not having a fair hearing was "laughable" and accused him of having "the behaviour of a narcissist who can't get beyond his own selfish interests," adding that his behaviour in counsel had been "shameful". US authorities have requested Mr. Assange's extradition and charged the activist with involvement in computer hacking alongside Chelsea Manning on charges filed on 10 March, with the Metropolitan police stating that the arrest was made on behalf of US authorities. If convicted, Assange faces up to five years in jail, with the US Justice Department's Office of Internal Affairs handling the extradition request. UK prime minister Theresa May has welcomed Mr. Assange's arrest, stating that "no one is above the law".